21st May, 2017 in the village of Golovinka of Lazarevsky district of the Krasnodar Territory, Circassians living on the Black Sea coast, have held a traditional moleben according to national customs, dedicated to the memory of ancestors who died more than a century and a half ago during the Russo-Circassian war. During the memorial service, sacrificial baking was given for the memories of the deseased. After the moleben, those attending the event descended to the seashore to lay wreaths and fresh flowers on the water. 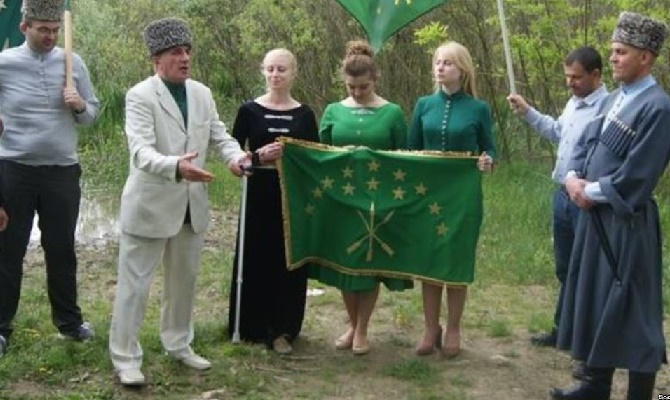 The elder of the Black Sea Circassians Ruslan Gvashev addressed the audience with a small speech, where he told about the events that took place at these places and urged not to forget those who died defending their native land. After 10 days, on 2nd June, Ruslan Gvashev and Aydamir Basto were convicted for this measure by the court of Lazarevsky district. Gvashev was sentenced to a fine of 10,000 rubles. Basto – at 30 000 rubles. Judge Kozyrev N.A. She motivated her verdict by the fact that they did not file a statutory notice for the mass event. In another 10 days after these two were convicted, another event occurred. On 12th June, 2017, in the settlement of Fazanniy, in the Kirov district of the Stavropol Territory, on the 238th anniversary of the battle of the Terek Cossacks with the mountaineers, the priest commemorated the dead Cossacks who defended the local fortress. The very beginning of the history of the village dates back to 1778. Then, during the construction of the Azov-Mozdok defensive line, a fortress of St. Mary (Maryevsky farm) was built to strengthen and protect the southern borders of the Russian state. After the requiem, the priest appealed to the Cossacks about the duty of the descendants to prayerfully honor the memory of their ancestors who defended their native land. Then the priest went with the Cossacks to the place of the fortress, where a commemorative cross is now erected. Cossacks laid a wreath at the cross on the site of the former fortress. The Cossacks and the priest agreed that the commemoration of the deceased soldiers on that day would become a pious tradition of the Staromarievskiy Cossack community. In the second case, there is also no prior filing of a statutory notice for the mass event – nor is there any talk of the participants taking any punishment. Tatyana Nikolaevna. We urge you to understand this situation. We do not call to punish the Cossacks of Fazanniy settlement for a memorial service in memory of their ancestors. We consider it an inalienable right of every person to honor the memory of their dead ancestors. We ask you to answer the question – why are Ruslan Gwashev and Aydamir Basto were punished? Has the official norm in the Russian Federation applied differently to people of different nationalities, different classes and different religions? Chairman of the Coordinating Council of Adygean Public Organizations Zhilyabi Kalmykov.